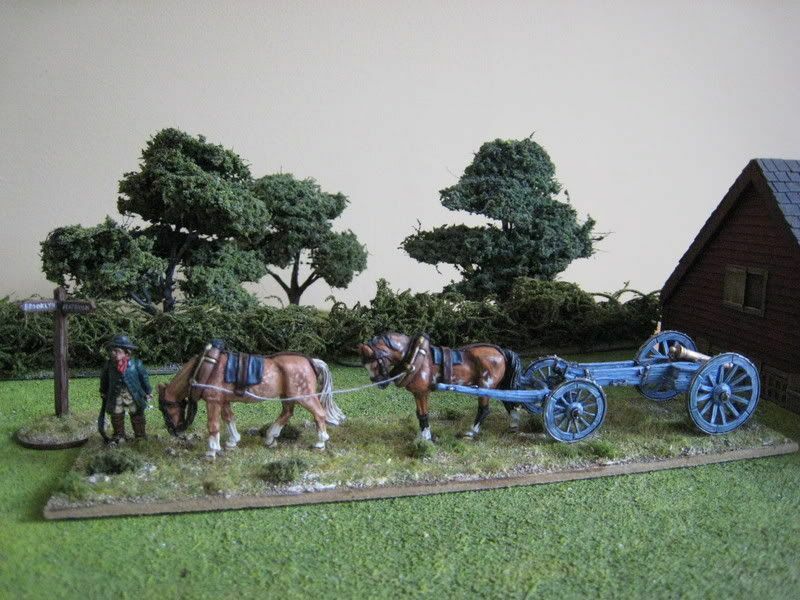 I am slowly working through a couple of Perry limbers and wagons that have been in the lead-pile since the beginning of the year. This is the 6-pounder gun and limber. It's affiliation is non-specific, and I have painted it as a British set - hence the "blue-grey" colour on the woodwork. My recent visit to the Royal Artillery museum at Woolwich taught me that the exact colour of RA "blue-grey" must have varied considerably over the years. I saw guns and carriages of all kinds of shades of grey; I recall a WW1 gun that was an almost exact match for the Foundry "Quagmire" palette. As I have mentioned before, my British colour is a bit too "blue", but it's too late in my collection to change that now. 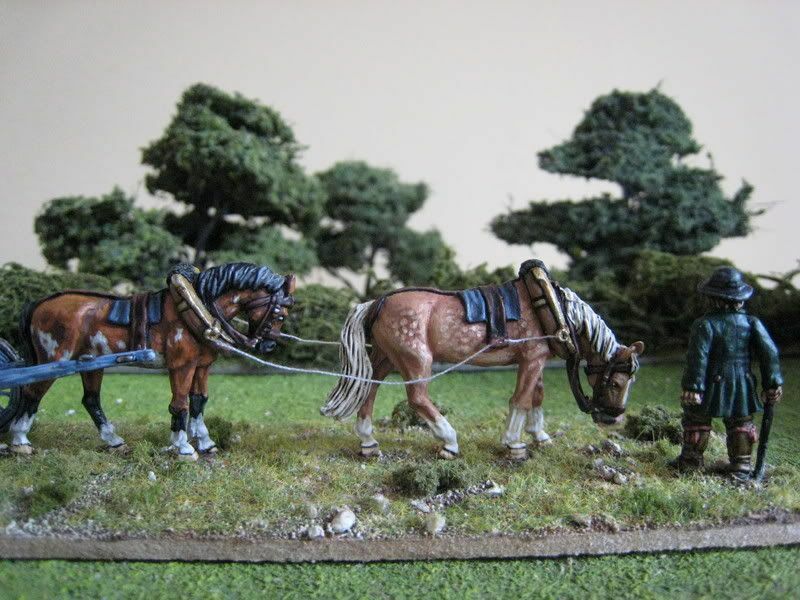 I enjoyed researching and painting the horses. 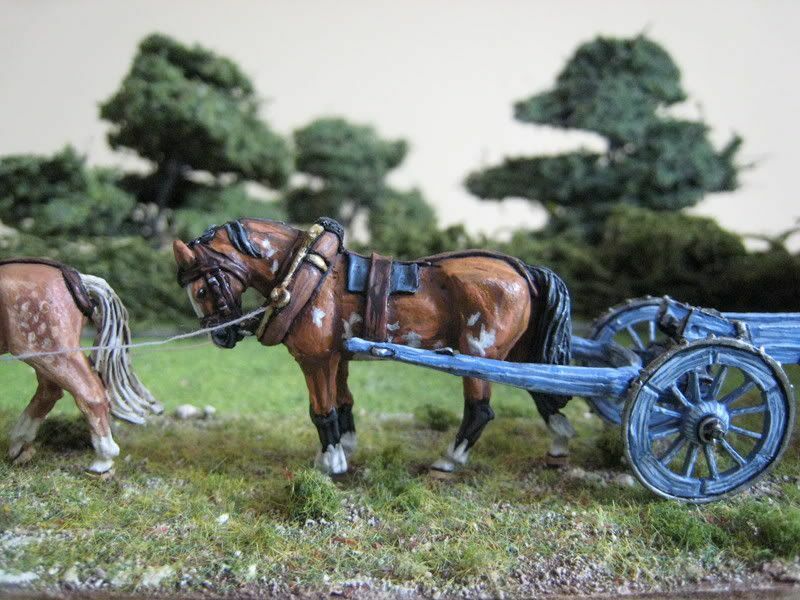 Nowadays I always insist on ensuring that each horse I paint is an identifiable breed, and for non-cavalry horses I like to branch out into something a bit more advanced than "bay" or "chestnut". The front horse is a palomino and the rear one is a red bay overo. I know very little about the history of horse genes, but I understand that "overo" means "a pinto colouration pattern over a dark body". Whatever. 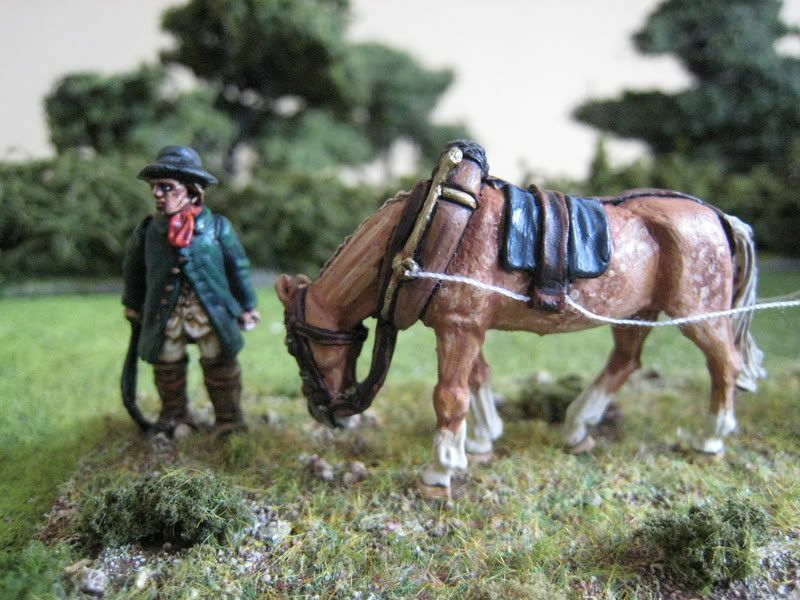 Anyway, a few photos provided the template for this second horse, which was painted predominantly with the Foundry "Tan" palette (with a couple of extra highlights mixed). A few notes on the painting of this set can be found here. The traces are white cotton - I thought the cotton looked ok without being painted, but it is too white and I need to tone it down either with some paint or an ink wash. The signpost came from a pack I found at Dave Thomas' stand at the Woolwich "Firepower" show. The pack contains 4 such items, a roadway milestone and a wheelbarrow. I think this pack is from the SYW range, but I have never seen it on the Foundry website. It must be a pre-release/re-release/un-released pack. God (aka Bryan Ansell) only knows whether this pack is commercially available. 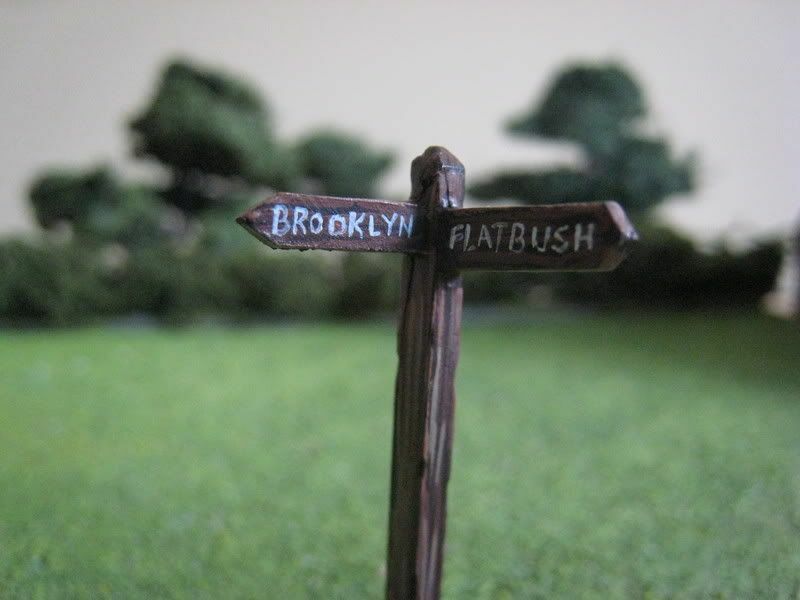 The signpost has been painted up with an eye on November's Long Island game - it points to Brooklyn and the hamlet of Flatbush. I discussed this game with Mr Eclaireur today and now have an idea of what I need to produce for it. 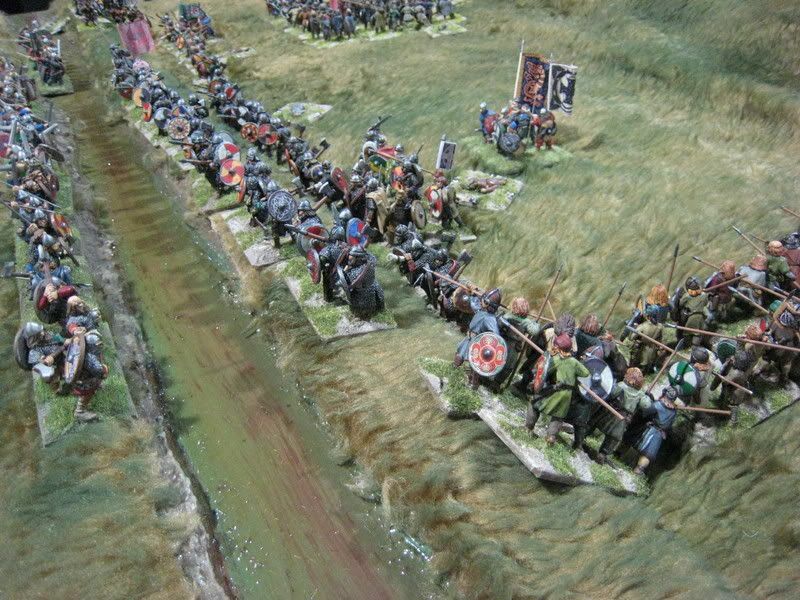 Being aware that simply posting photos of what I paint is probably a bit dull, I will add to the "wargaming" remit of this blog by posting updates on what I need to get ready for the Long Island game and how the orbat shapes up. 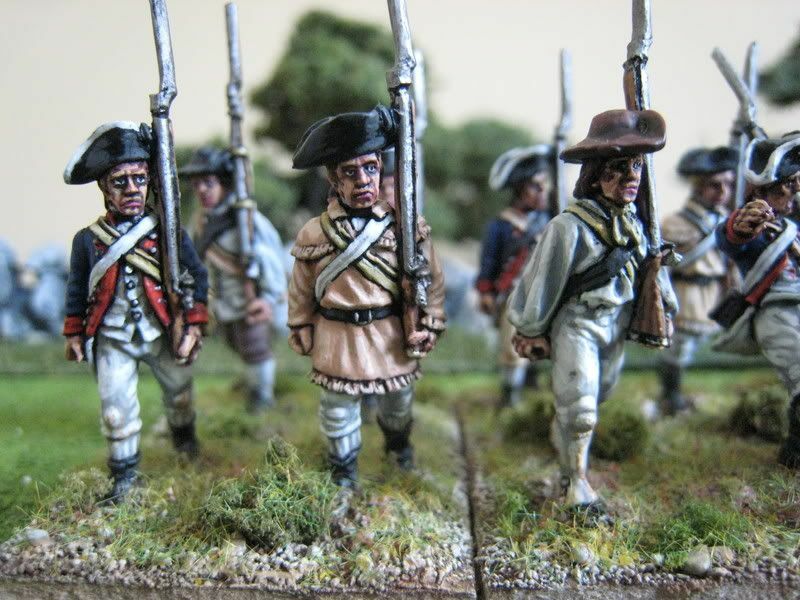 This is the Perry pack of civilians, which I bought from Dave Thomas at the Woolwich show a couple of week ago. 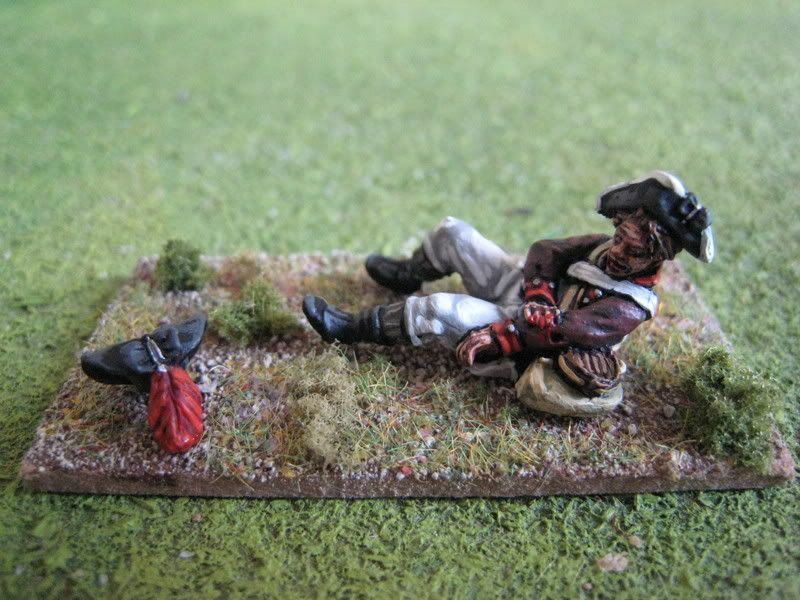 With "one-off" packs like these, I find it very tempting to follow the colours used by the painters on the Perry Miniatures website, and I did so for the chap carrying the barrel, althugh I don't think I managed to highlight the black suit as subtley as Maestro Woodward did. I have seen people say that the best way to highlight black is to add purple, or flesh tones or something like that; this figure uses the Foundry "Charcoal Black" palette and this paint triad doesn't quite work for larger areas of colour. For the old gentleman and his wife/daughter, I looked at a catalogue of paintings by Thomas Gainsborough for inspiration. The man's outfit of light brown coat and yellow waistcoat is taken from a 1777 portrait of Carl Friedrich Abel, a German composer who lived in London and who provided music lessons to the royal family (for which see here). The woman's turquoise and gold dress comes from a 1778/79 painting of Anne, Lady Rodney, wife of the eldest son of the famous admiral (for which see here). 6 figures. Painted August 2008. 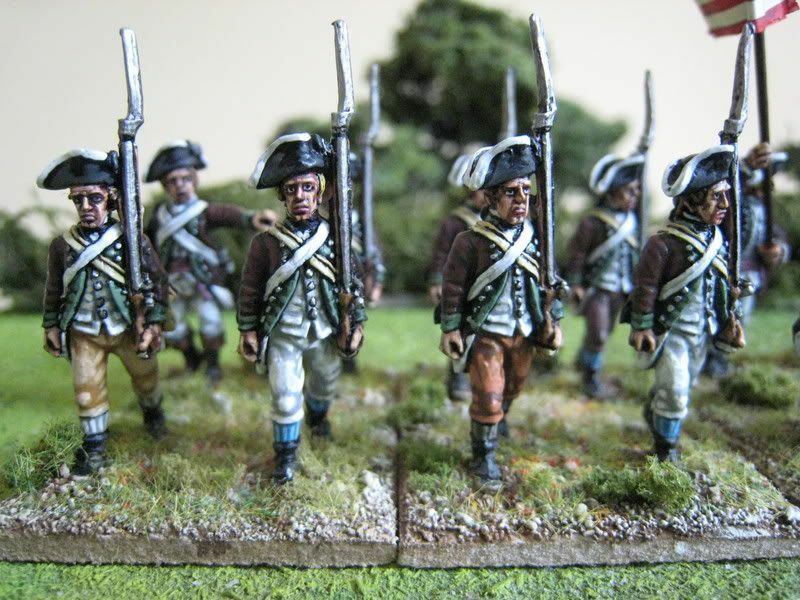 I painted this unit because I wanted a smart looking regiment of marching Perry figures. 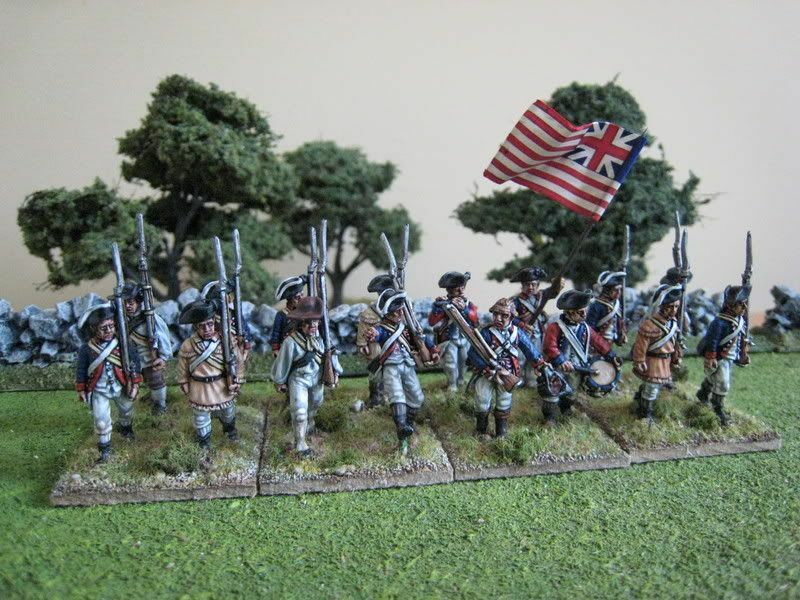 I estimate that I have about 4-5 more American regiments in the leadpile, and Foundry's current 20% off sale is tempting me to buy a couple more packs of standing Continentals (perhaps to paint up as Virginians in their imported French uniforms). But I am finished with American regulars for a while, as it's time to move on to something different. 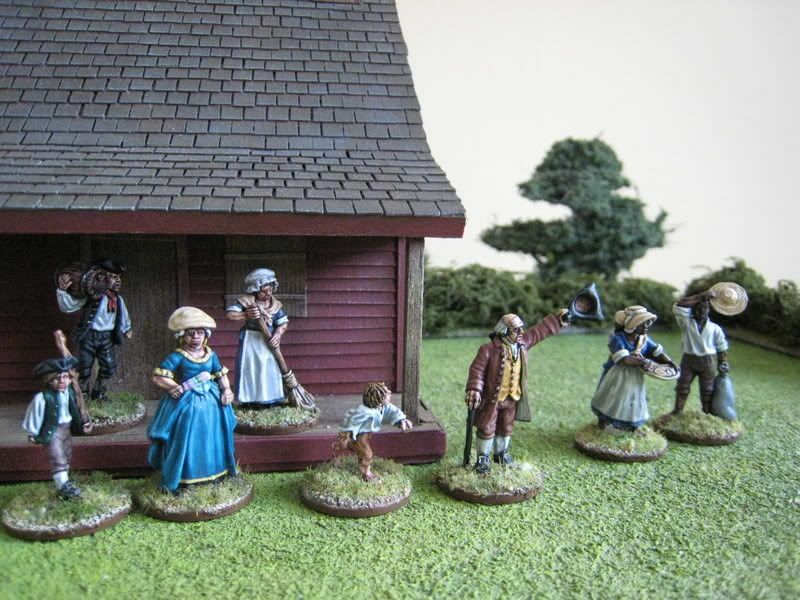 I have been rather remiss at posting updates recently, but painting has continued apace and recently completed figures include Perry civilians, a British 6-pounder limber and Henley's Additional Continental Regt. Pics of those should be up over the course of the next week, but if you want to see a taster, here is a step-by-step of the British limber. 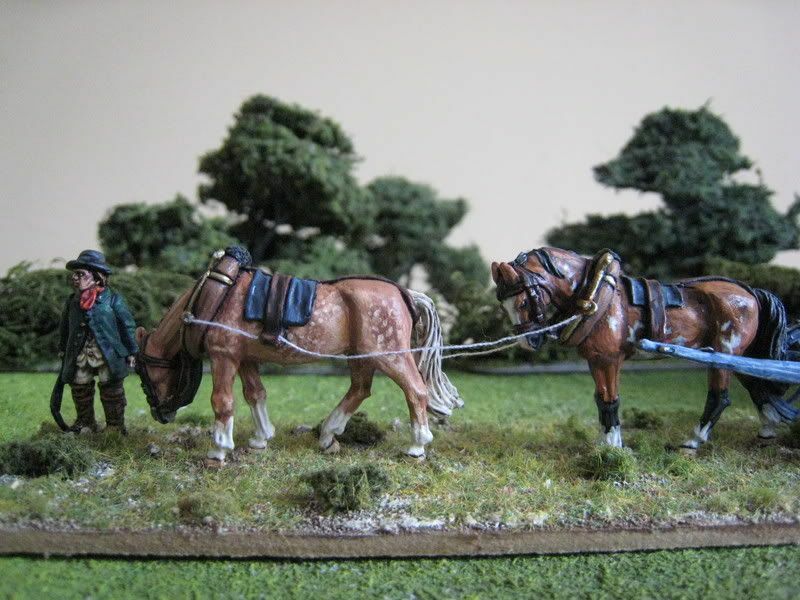 I enjoyed painting the horses so much that I am going to start on more wagons and cavalry soon, once I have finished a new American militia unit featuring those rather fun "nervous" Perry figures. 20 figures. Painted July/August 2008. Flag by GMB. Last Sunday I paid another visit to the "Firepower" Royal Artillery museum in Woolwich to see the "Whiff of Grapeshot" show. This is a small show, but on this year's evidence it is getting bigger. There were more trade stands and games, the latter being of a pretty high quality. 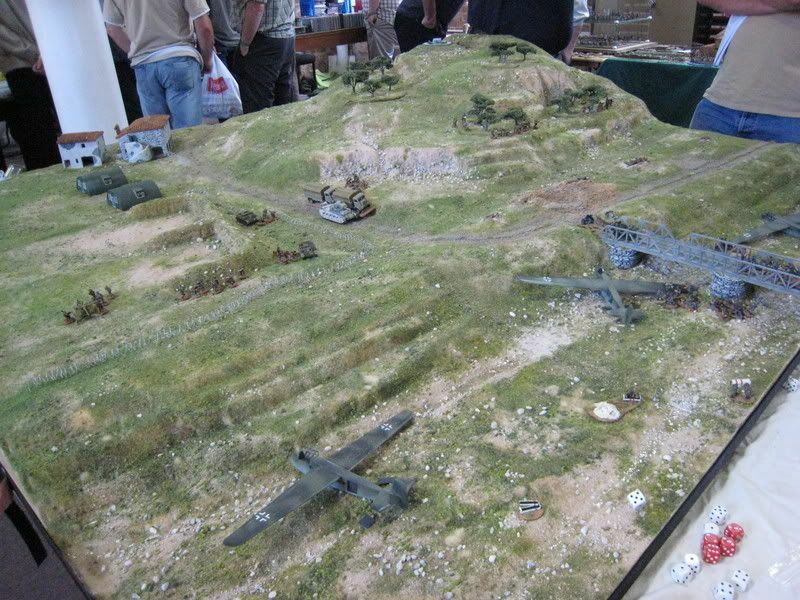 The ability to peruse Dave Thomas' stand without the crush of a show like Salute in itself makes the trip worthwhile. Then of course, you have the museum exhibits themselves, which are of such variety that I can see myself finding something new of interest with each visit. The lads from Tablescape were there this year; my model of the Benjamin Ring house from Brandywine is almost finished, and I paid the deposit on a couple of farm buildings. We also discussed the probable next model, Harvard Church. I was very impressed with the games on display. 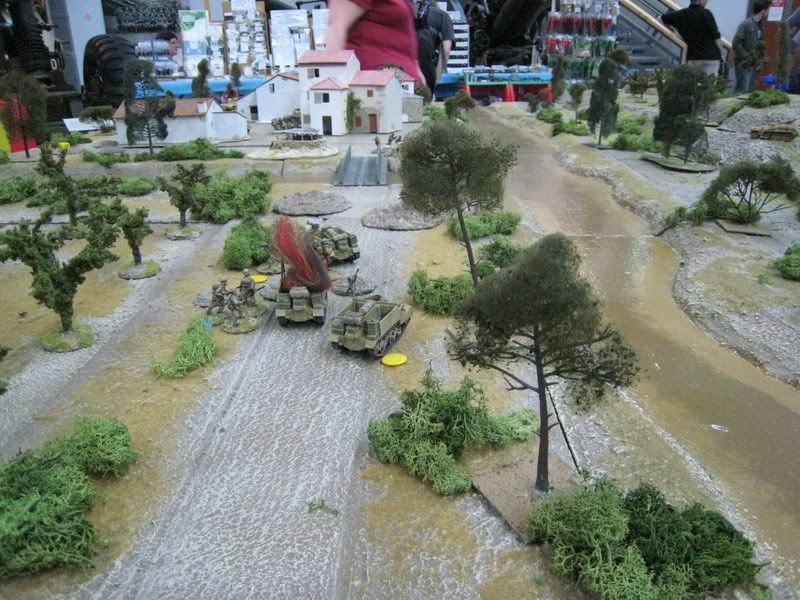 A few photos are below; regrettably I can't recall whose games these are, but they are the 15mm Fall of Crete and 25mm Sicily (I think). There seemed to be a WW2 bent in both games and trade goods, not altogether inappropriate given the surroundings I suppose. 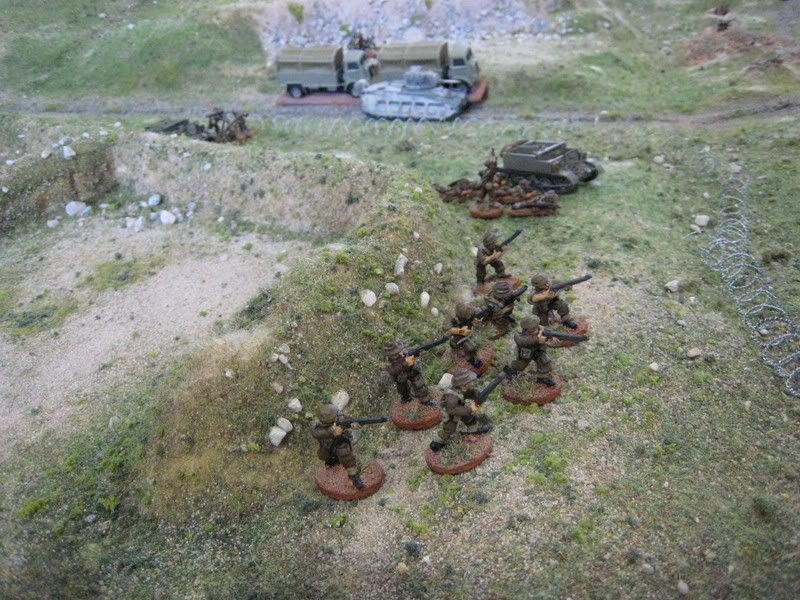 I was taken with Anglian Miniatures' Spanish Civil War range and Tiger Miniatures' colonial ranges, but purchases were limited to a few packs from Dave Thomas and the latest WSS issues. Unfortunately, a call from work cut short my visit, so I missed Henry Hyde's much-feted Zulu game and the chance to see how all these games developed. This is a show I recommend to anyone in the South London area. 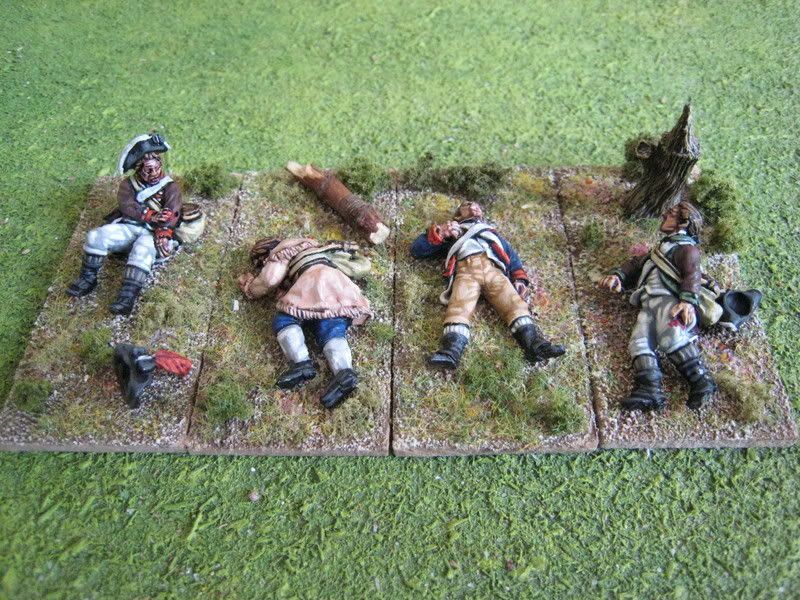 Here are some more casualty figures I painted a couple of weeks ago. 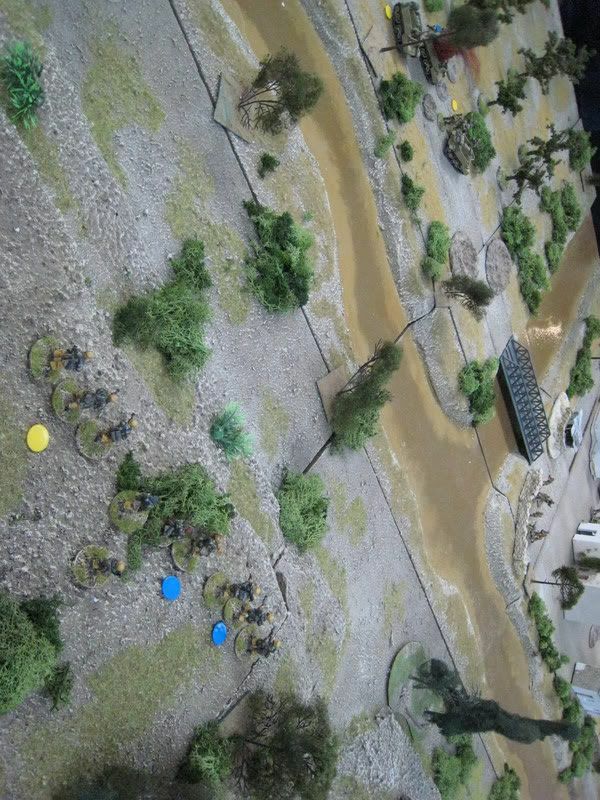 I used to base casualty figures on 2-pence pieces, but these larger bases allow for a more scenic and creative approach. The British light infantry hat is a leftover from one of the artillery wagon sets. 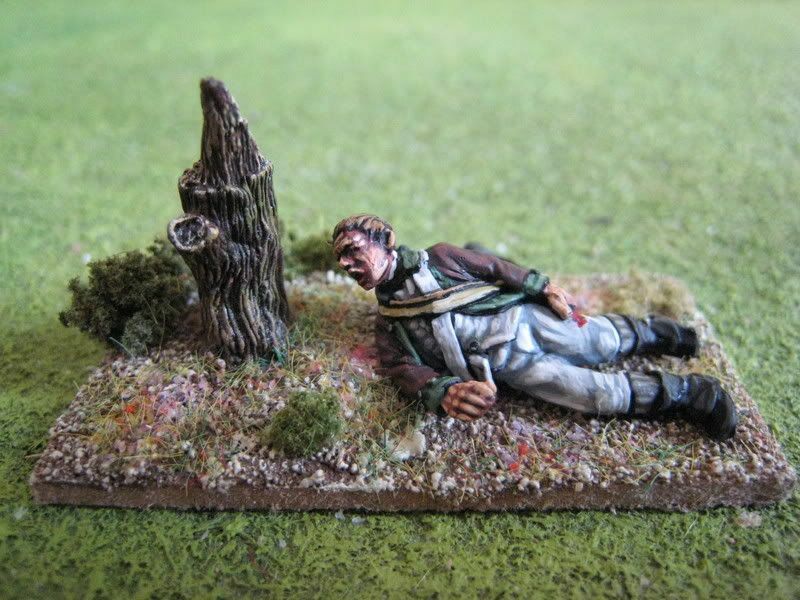 The tree trunks are from Redoubt Miniatures. 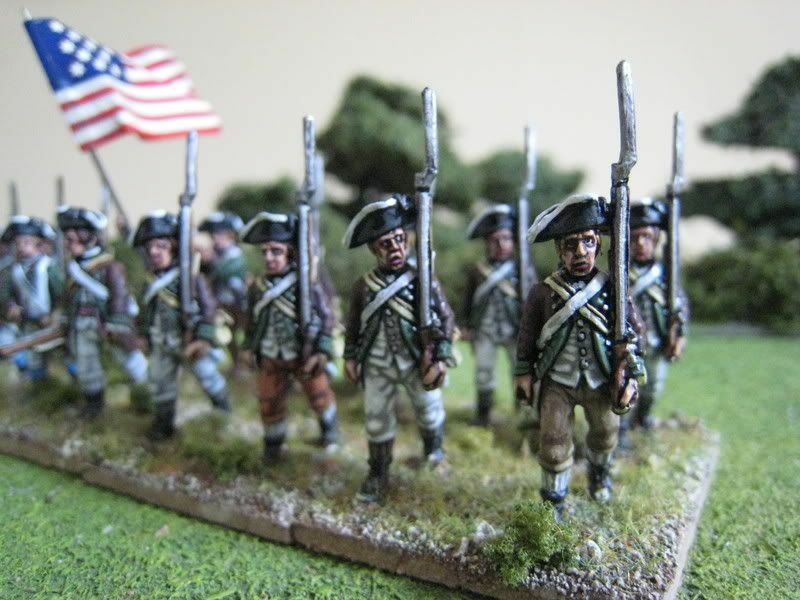 I am still busy painting American regiments (the 2nd Pennsylvania is finished and I am working on Henley's Additional), and have benefited from discussions with Ronan and others about what the Continental army of 1776 would probably have looked like. 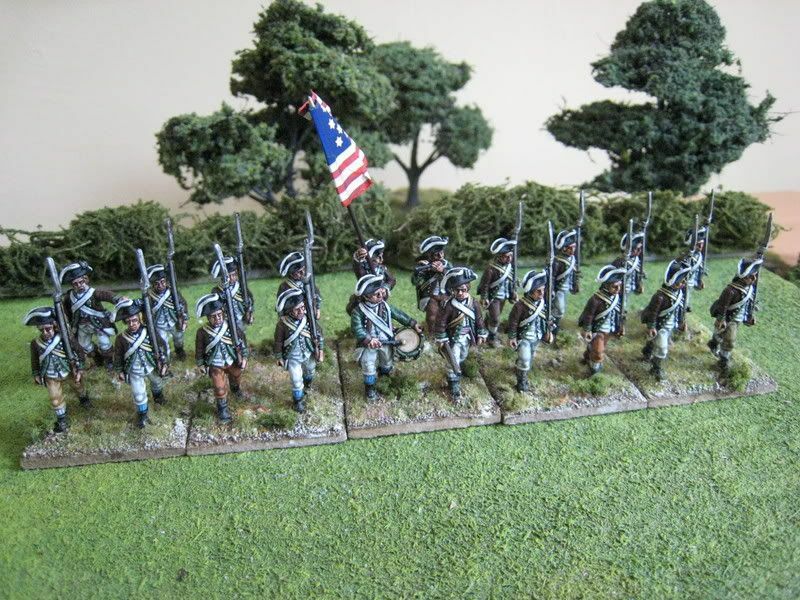 Apparently the 22nd Continental isn't half as scruffy as it should be, so I am thinking about painting another couple of "1776" regiments with a view to deploying them in November's Long Island game. 4 figures. Painted July 2008. 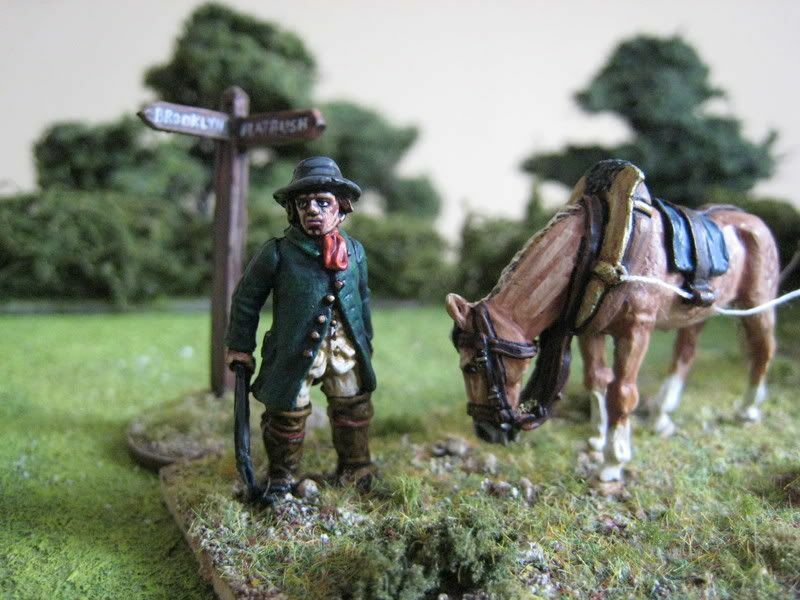 As I mentioned before, the new Perry Southern Militia/Continental packs allow one to build up "hot weather" regiments, with soldiers in coats and hunting shirts alongside others in shirt sleeves and waistcoats. I've always thought that Alan Perry perhaps missed a trick when releasing his first Continental packs a few years ago in not adding a couple of packs of figures in shirt sleeve order. But now it's possible to recreate the look of regiments marching under the hot sun and this is the first of 2 or 3 units that I want to paint up in this fashion. The direct inspiration is the painting by Don Troiani of George Washington (here). I like to give my regiments names. I originally selected the 6th Virginia, on the basis of it filling a gap in the Brandywine orbat that I generally work to. Der Alte Fritz posted a comment to the effect that the uniform of the 6th Virginia is known as being a light hunting shirt with red cuffs; i.e. not at all what we have here. The post and my response can be seen in the comments. Whilst not entirely convinced, I realised that the 6th Virginia is probably best left for another day. 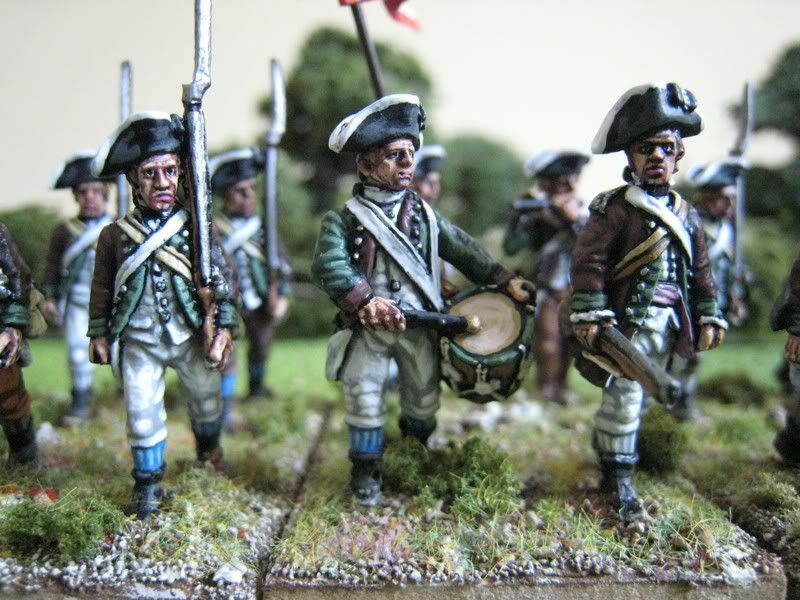 A quick bit of research and consultation with Ronan the Librarian/Supercilius Maximus resulted in the re-naming of this unit the 22nd Continental Regiment. 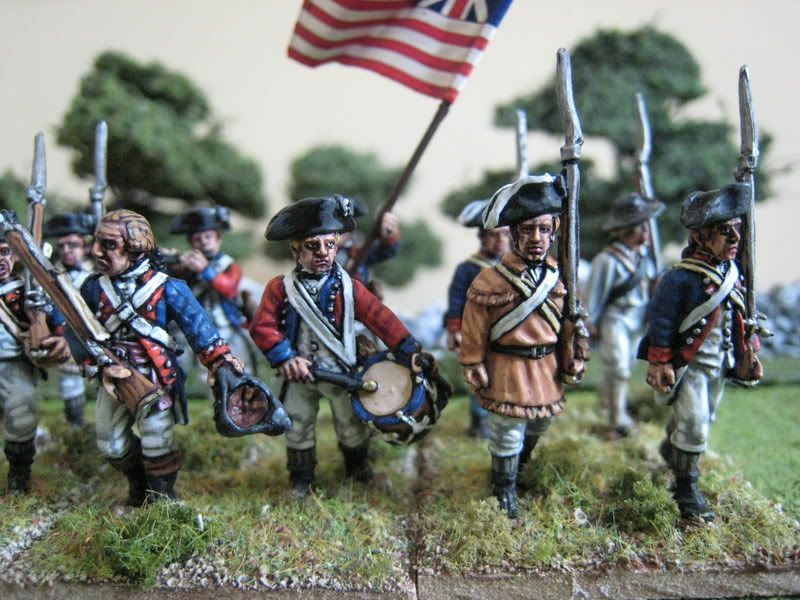 This unit is reported as having worn blue faced red coats in the 1776 period. The flag is the "Grand Union Flag", which seems to have originally started off as a naval flag in December 1775 but was then used by Washington's army in the 1776-77 period. 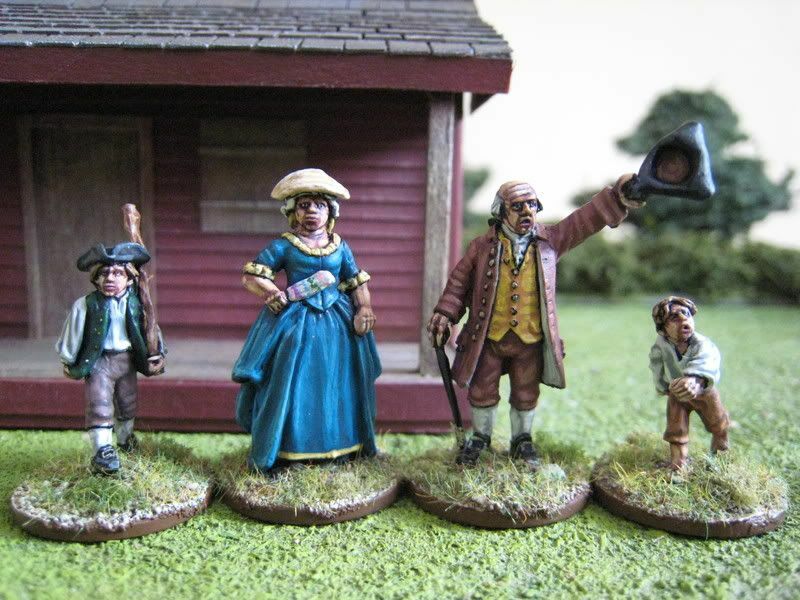 All the figures are Perry save for the officer, who is a Foundry British sculpt that works perfectly well as a Continental officer (he also appears in my otherwise Eureka-figure 10th Virginia). 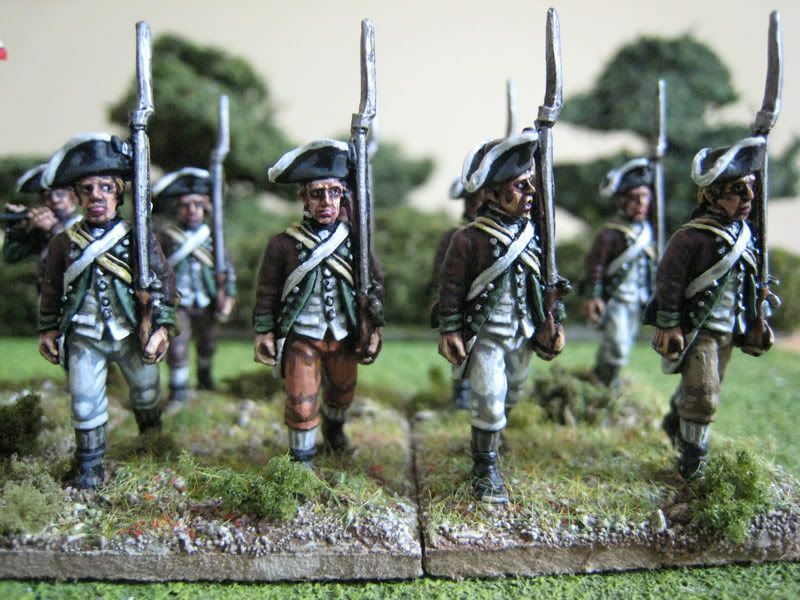 Hopefully this regiment will see action at November's Long Island game. Thanks to Fritz for his comments - ultimately, the purpose of blogs like this is to prompt an exchange of knowledge. 16 figures. Painted June/July 2008. Flag from GMB.